Biden’s announcement comes as the U.S. and Brazil are attempting to mend fences in the aftermath of revelations that the National Security Agency had tapped President Rousseff’s cell phone and spied on other Brazilian government agencies. The United States covertly supported the military coup that deposed President Joao Goulart on April 1, 1964, and maintained close ties to Brazil’s military rulers during the dictatorship. American diplomats, intelligence operatives and military personnel reported routinely, and in detail, about regime policies – and abuses. The Archive has obtained the release of portions of this critically important historical record through the Freedom of Information Act, and has posted a number of files relating to the U.S. role in the 1964 coup that brought the dictatorship to power. Dilma Rousseff and Barack Obama at the official launch of the Open Government Partnership in September 2011. Rousseff’s government has been an active proponent of freedom of information. 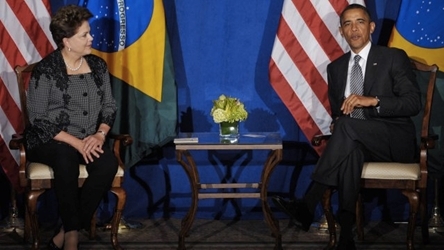 Brazil served as co-chair of the Obama-led Open Government Partnership. In 2012, the country implemented a new information access law, taking a further step out of the persistent shadow of two decades of military rule. ← FRINFORMSUM 6/19/2014: The FBI’s Elite Hostage Rescue Team, the Bureau’s 83-Page Guide to Twitter Slang, and Much More.